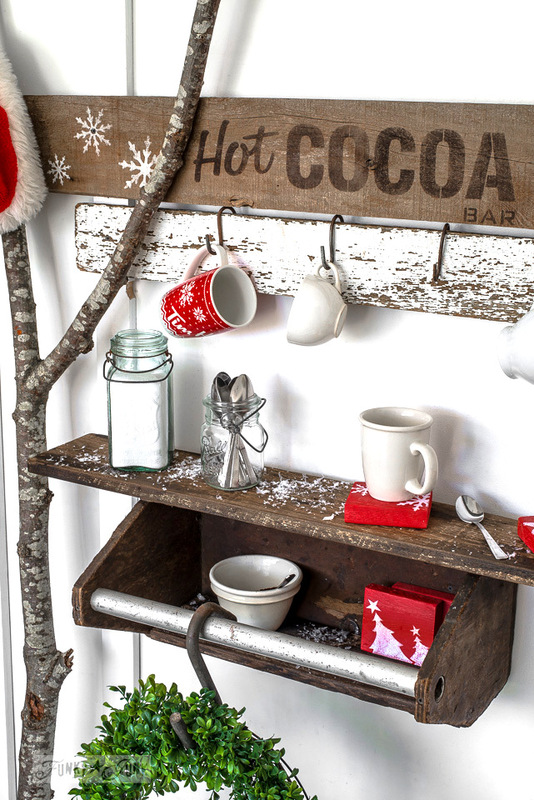 Every Christmas, I love to dream up a new hot cocoa bar idea. Blame it on our currently blustery weather! It. Is. COLD. And we west coaster Canadians aren’t use to it. So this year, a cheater idea came to mind. How about a toolbox shelf? I love not having to build everything from scratch if possible! And this worked. Any wooden toolbox you like. This one happened to have a metal tube for a handle which I really love. 2. You’ll also need some planks. One for the top, and one for inside the toolbox, if you desire to add more depth to the shelf part. 3. Match up the boards to the toolbox if desired. 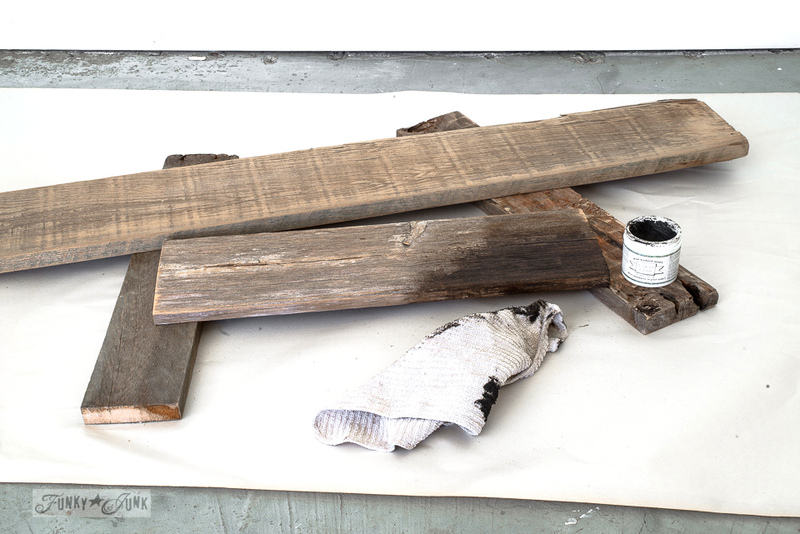 Since the toolbox was stained dark, I chose to go for a wood toned look, darkening these boards with Miss Mustard Seed’s Antique Wax I was given awhile back. It’s super dark, so this did the trick beautifully! 4. 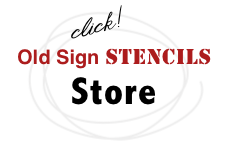 Stencil the sign board. Hot Cocoa was centred, then held in place with masking tape. Using a very dry brush, the inside of the letters were tapped, filling them in with paint. The snowflakes were added in a super random placement, using all three sizes. 4. Mount the sign board by screwing it directly onto the wall. *Tip: You will need to add blocks of wood for spacers for the 2nd board if you desire to use S hooks. My walls have a board and batten treatment offering the space. 6. 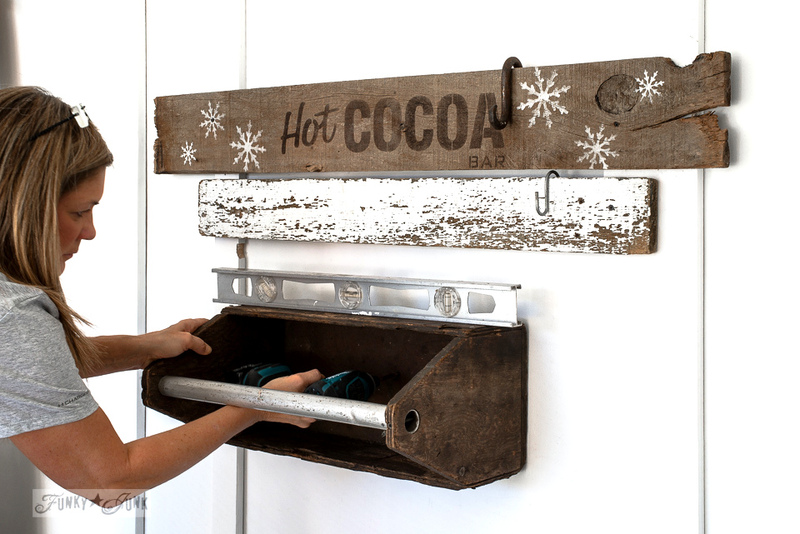 Mount the toolbox to the wall. Place level on tip, and install with one screw, level, then secure with more screws. Tip: You may need wall anchors if you plan to add lots of weight to your toolbox shelf. 7. 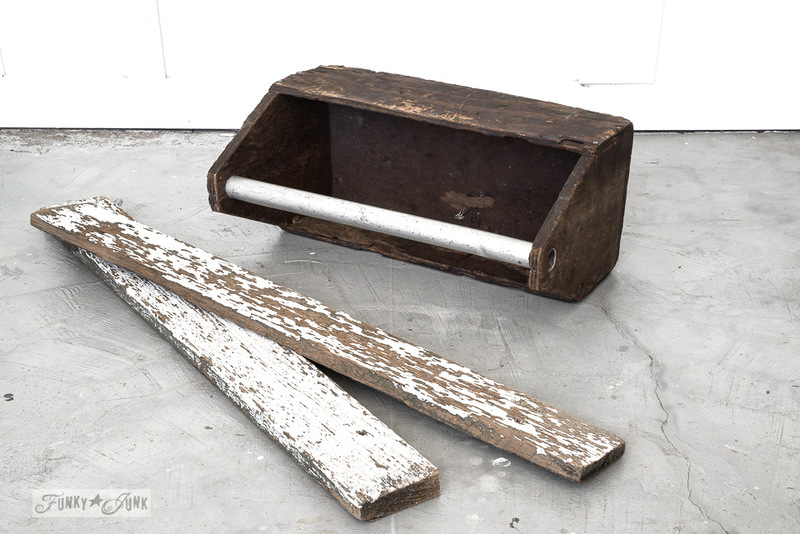 Add a plank across the top of the toolbox to deepen and extend the surface. Coasters are so easy to make, and super customizable. 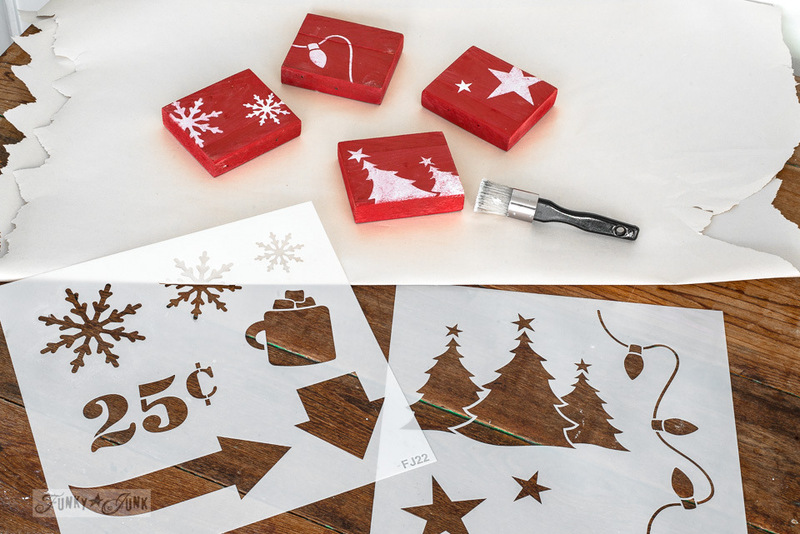 They would make super inexpensive gifts! 1. Cut chunks of wood to desired size. Coat with paint if desired. 2. Stencil bits and pieces of various designs. So fun! I think my fav part is the white snowflakes with the brown toned letters. That just spells chocolate and marshmallows! Which I’m totally overdue for. Do you stock this stuff year around? As for that toolbox shelf idea? Think you’ll make one? What would you use it for? This is so cool and I love that splash of red. I can hardly wait to move there are so many new fun things I want to do. This is simply classic and something I’m going to incorporate in our workshop/office space when the move finally hits. LOVE!!! Love love love this! What a beauty! Hi Lee! Thank you! I usually find the hooks from thrift stores or antique shops. I don’t buy new as a general rule. I have found the newer ones tend to be smaller and thicker! I’d try to find a place that sells old junk and tools and such. SOOOO CUTE!!! LOVE IT! Happy Holidays! 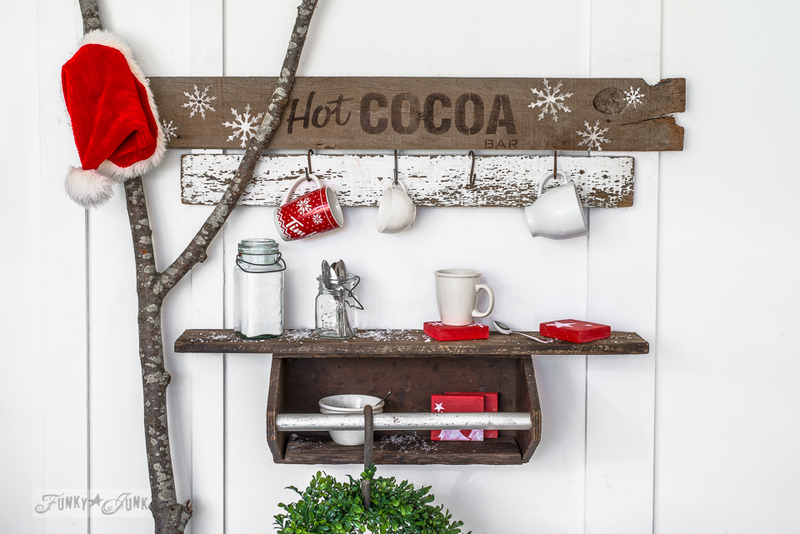 Your hot cocoa bar is so clever. 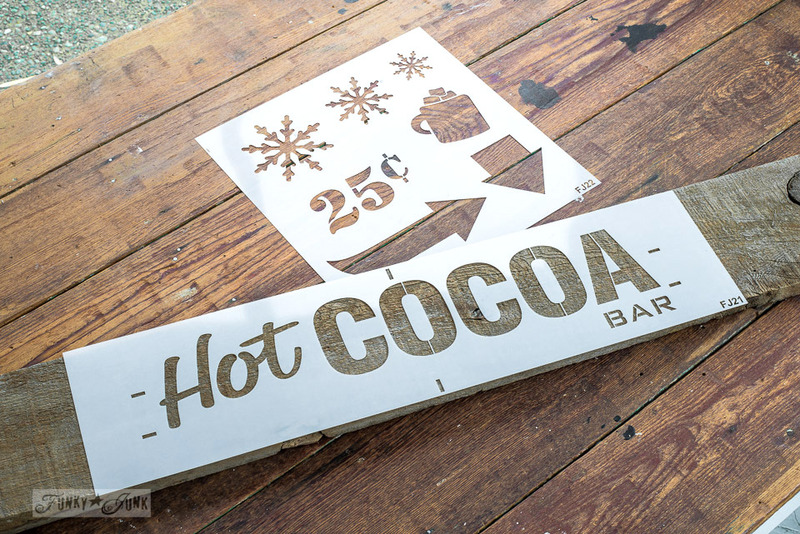 I love the stencil and that you make a new cocoa bar each year. It’s fun to change things up a bit. And yes the windchill is frightful for us right now! What a great idea! Very nice, Donna. This is the cutes idea! Love the project, the way you’ve arranged/showcased everything, and those cute coasters. You’ve hit a homerun with this one. Great inspiration! 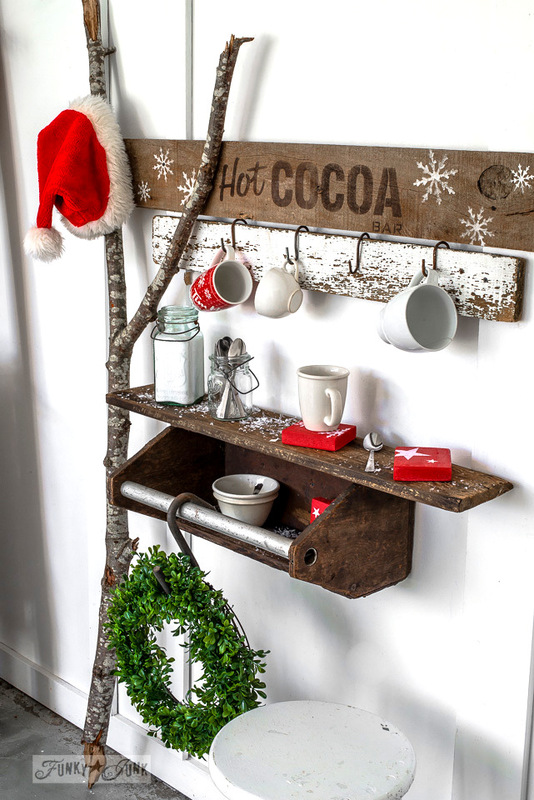 I had an old tool box on the dining room wall like that not long ago. I just love your ideas! You always find a new “outside of the proverbial box” idea. It’s cold here too. Brr! Ha Ha! only a Canadian would have a Tim’s mug on there! BHAHAHA you know it! Love the sweater motif! 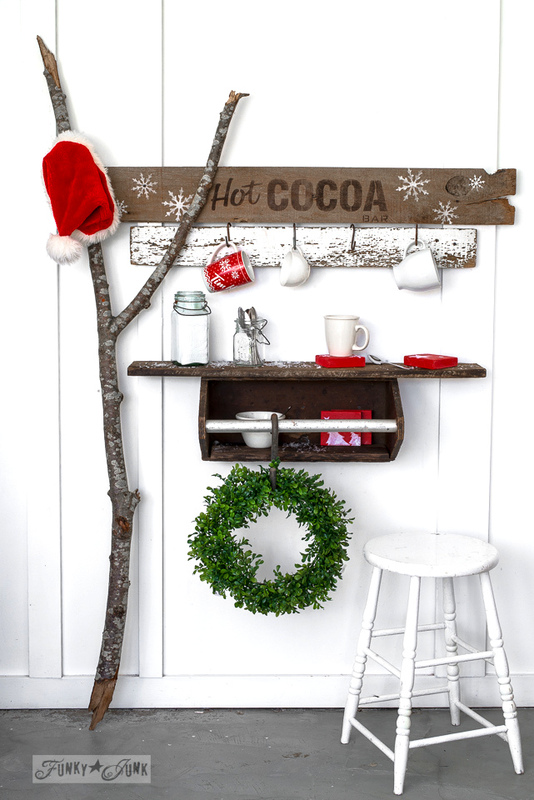 Wow – that boxwood wreath & bits of red really makes your Hot Cocoa bar look beautiful! 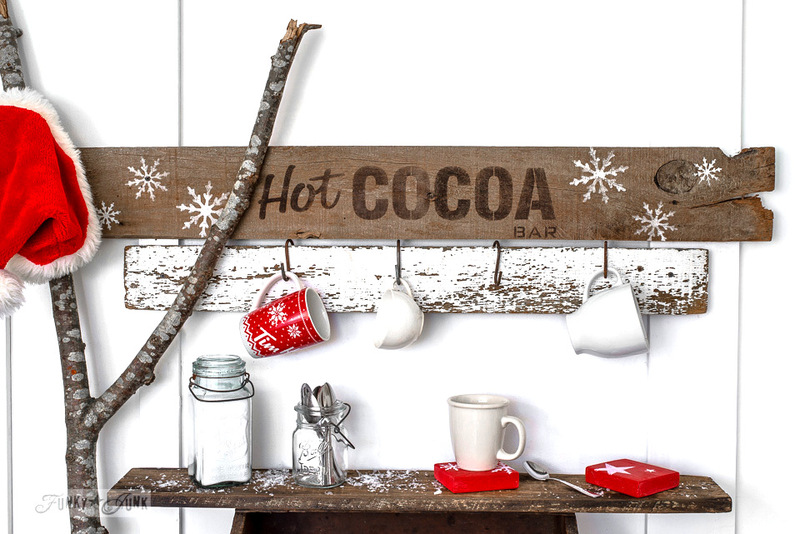 It’s awfully cold here in Michigan too and hot cocoa sounds good! I just said wow out load again. The kids used to think I was nuts everytime I did that now they just say “Oh she must have seen somthing on that Funky Junky lady’s website”. LOL. Wow Donna! !